We like people who design their own instruments. And we especially like madd scientists who are obsessed with big bass. 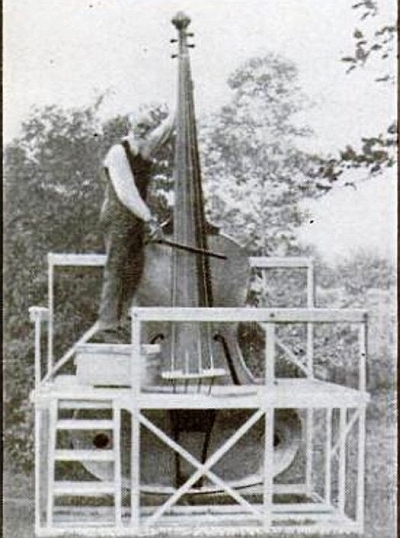 This photo of a fourteen-foot bass viol, being played by its builder with the aid of a platform, comes from the april 1935 issue of Popular Science magazine. "The neck, bridge and tailpiece are detachable to make it more easily portable". This mad scientist, known only as N.J. from Ironia (no joke), was a landscape gardener by profession, and he also built harps and cello's in his spare time.